The fundamental role of RNA in the universal processes of transcription and translation lead to the hypothesis of an era where RNAs could serve as both genetic material and metabolic enzymes. According to the RNA world hypothesis, these early ribozymes might catalyze formation of small peptides. 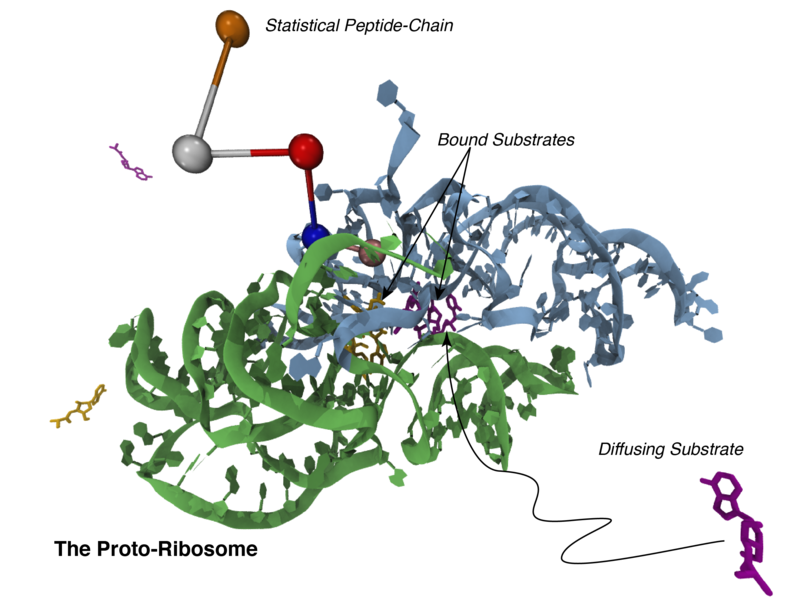 Evolutionary analysis of ribosome structures and sequences by Yonath and Woese has suggested fragments of a proto-ribosome, near the peptidyl-transferase center (PTC) might have functioned as such a ribozyme. Exploiting the structural and sequence symmetry of the PTC along with RNA structure-function relationships, researchers in the Luthey-Schulten lab have computationally designed a small protoribosome. With only ~4% of the nucleotides in a modern bacterial ribosome, the model remains stable throughout micro-second molecular dynamics simulations and incorporates freely diffusing adenosine-alanine substrates spontaneously into the peptidyl-tRNA binding site. Moreover, the model binds the charged tRNA mimics in both the aminoacyl- and peptidyl-tRNA binding sites and reorients the substrates into a transition intermediate favorable for peptide bond formation. The in silico designed proto-ribosome is currently under experimental investigation using native polyacrylamide gel electrophoresis (native PAGE) and isothermal titration calorimetry (ITC) in the Ha lab facilitated by the CPLC collaborations. Preliminary results indicate that the symmetric fragments assembly, but further experiments are required to demonstrate its ability to bind the charged tRNA mimics and generate statistical polypeptides. Such validation would reveal a possible pathway for the ancient RNA world to acquire proteins that could assist in the buildup of a more complex translation apparatus.